Passionate about plants? Here’s a guide to plant science destinations you can tour on your own, most of them part of the School of Integrative Plant Science in Cornell University’s College of Agriculture and Life Sciences. See descriptions below map. Inside the Palm House of the LHB Conservatory. Liberty Hyde Bailey Conservatory — Adjacent to Plant Science Building on Tower Road, this living collection of mostly tropical and subtropical plants from around the world is used primarily for teaching and some research. 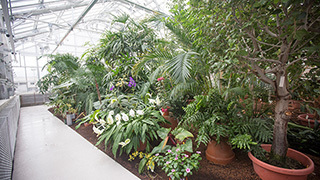 Named for world-renowned horticulturist and the first dean of the College of Agriculture, the Conservatory collection is curated by the Plant Biology Section’s Bailey Hortorium and maintained by the Cornell University Agricultural Experiment Station. Visit the LHB Conservatory website. West gate to Minns Garden. Minns Garden – Across the driveway to the west of the Conservatory, Minns Garden features flower and foliage plants from snow melt through late fall. Even when the snow is flying, it’s worth a quick visit to view the artful iron gates created by local sculptor Durand Van Doren. (Can you spot the seven famous apples hidden in the gate at the south entrance?) The garden is named for Lua A. Minns, Cornell’s first female floriculture faculty, who established the garden on its original site west of Garden Avenue in the 1910s to teach students hands-on horticulture. 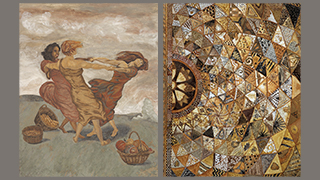 Three Sisters in Soil (left) and community mandala soil paintings. Soil paintings — Inside the east entrance to Bradfield and Emerson Halls (off patio near Fernow Hall), view paintings made entirely from soil-derived pigments. The paintings were created as part of a community engagement project to celebrate World Soil Day 2017. Three Sisters in Soil won the university division of the soil painting competition sponsored that year by the Food and Agriculture Organization of the United Nations (FAO). View videos and learn more about soil paintings. Fossil from the Bailey Hortorium Paleobotany Collection on display just east of the foyer. First Floor Foyer displays – One flight up from the south entrance to Plant Science off Tower Road, the foyer features time-lapse videos interspersed with other information on its flatscreen monitor, and a display detailing 150 Years of Plant Science at Cornell. 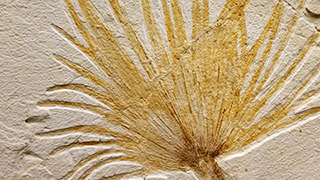 Just east of the foyer outside the School of Integrative Plant Science offices in Room 135, view fossils tracing the evolution of plants from Bailey Hortorium Paleobotany Collection. Just west of the foyer view art from students in our online botanical illustration course. Feel free to wander the halls of the building to see other plant science posters and displays. 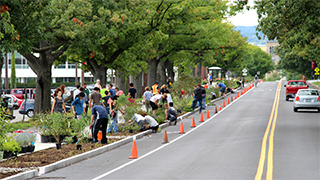 Urban Eden students installing the Tower Road bioswale in 2014. Sustainable Landscapes Trail — Developed by the Land Team of the President’s Campus Sustainability Committee, the trail showcases the sustainable design and ecosystems services of green infrastructure across the campus. Visit green roofs, water-filtering bioswales, native lawns and meadows, eco-friendly landscaping and more. These living laboratories are used for research and education as well as helping us meet the University’s sustainability goals. More information, trail map. 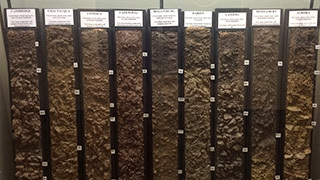 Explore soil diversity on the first floor of Bradfield Hall. Soil Monolith Collection – Curated by the Soil and Crop Sciences Section and located primarily on the first floor of Bradfield Hall. Explore the many soil monoliths (excavated profiles) representing the diversity of New York soils and beyond. Learn about the different soil horizons from the organic matter layer on the surface down to the bedrock and how we classify them. View these videos to learn more about soil monoliths. 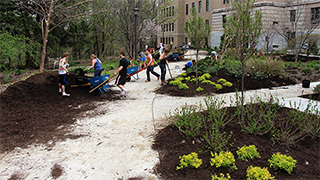 Urban Eden students installing landscape in the Deans Garden behind Warren Hall. Urban Eden Landscapes — Every year since 2001, students in Creating the Urban Eden: Woody Plant Selection, Design, and Landscape Establishment (HORT/LA 4910/4920) have taken on real world projects, designing and installing gardens on campus each spring — including the one between the LHB Conservatory and the Plant Science Driveway in 2016. View this map to take a walking tour of locations designed and installed by students in the class, including and the bioswale on the south side of Tower Road that filters runoff. 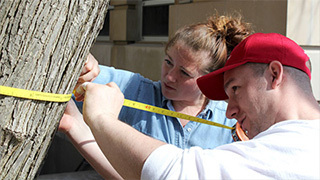 ‘Urban Eden’ students measure Ag Quad tree to calculate ecological and energy-saving benefits. Woody Plants Tour – Take a quick tour of notable nearby trees, vines and shrubs at the Woody Plants Database. The website helps students and landscape professionals match woody plants to environmental conditions where they’ll thrive, and features 20 other walks. Also be sure to check out the protected ‘hidden garden’ tucked into a small courtyard northwest of the Conservatory where plants more commonly found in warmer climates grow. Mann Library — Adjacent to Plant Science Building, Mann Library often hosts exhibits of interest to the plant science community. Currently, you can visit the second floor Gallery to view the Climate Smart Farming multimedia exhibit. 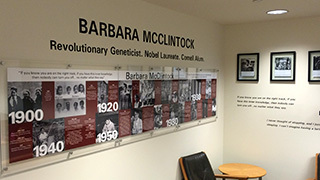 And on the third floor there is a permanent exhibit and timeline tracing the career of Cornell geneticist and Nobel Laureate, Barbara McClintock. Viticulture and Enology Students use these plants to learn to ID wine scents. 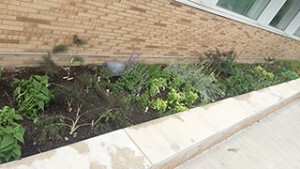 Wine Scent Garden – Located behind Stocking Hall. Viticulture and Enology students use the fragrant plants in this garden to learn how to identify aromas found in wine, such as rose (found in Muscat grapes and wines), lemon, lime, pineapple and grass (perceived in many white wines) and licorice, curry, chocolate and tobacco (common descriptors for red wines). Plants include various mints (Mentha spp.) and scented geraniums (Pelargonium spp. ), bronze fennel (Foeniculum vulgare), curry plant (Helichrysum italicum), bee balm (Monarda spp.) and more. Learn more. Weed Science Teaching Garden – Located behind the Muenscher Greenhouses off Caldwell Road, this garden boasts 125 species of important weeds found in farm fields and gardens, poisonous plants, and species that can invade natural areas. The garden is used by the Soil and Crop Sciences Section to help students learn to identify these plant threats. The best time to visit is mid-summer to first frost. Visit the Weed Ecology website. Use the Turfgrass and Landscape Weed ID website to identify weeds at home. 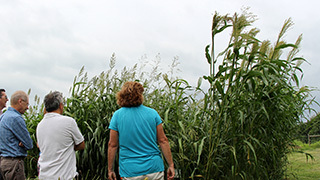 Towering broomcorn (used to make brooms) is among the dozens of plants you’ll find in the Crops of the World Garden. Crops of the World Garden – Ever wonder what rice, sugarcane or even stevia look like in the field? 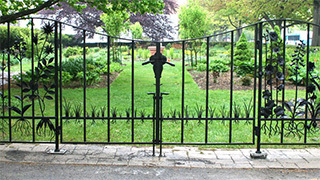 Located at the northeast corner of Caldwell Field adjacent to Arboretum Road, this demonstration garden showcases dozens of economically important food, textile and other crops from around the world, including historical corn row spacings, the Iroquis ‘Three Sisters’ planting method and more. The best time to visit is mid-summer to first frost. Visit the Crops of the World Garden website]. 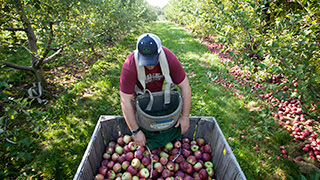 Cornell Orchards sells fruit, cider and produce in season from our research farms. Cornell Orchards – Teaching, research and outreach site. Retail store sells fruit, cider, and produce from our research farms from late August through April. Visit the Cornell Orchards website to find out what’s in season. 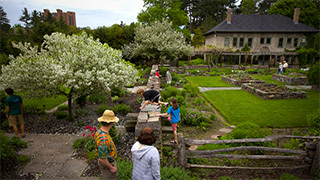 Robison York State Herb Garden at Cornell Plantations. 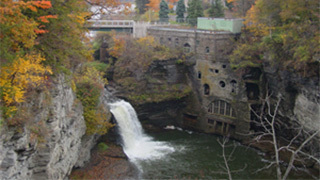 Cornell Botanic Gardens (formerly Cornell Plantations) – Cornell’s world-class botanical gardens, arboretum and natural areas are alive with plants, purpose and presence, and help make the university unique among its peers. Stop by the Nevin Welcome Center to view displays or pick up a map. Visit the Plantations’ website to plan your visit. Don’t miss the Climate Change Demonstration Garden. Fall Creek below Beebe Lake. CU in Nature – Helps you find locations around campus where you can connect with nature to reduce stress and improve your mood, alertness, concentration and overall sense of well-being. Visit CU in Nature.